This Horn Drinking Beaker is the latest addition to the Museums’ Collection. It dates from the time of the Peninsular War. It is interesting to speculate how many times it may have been drunk from during that period and subsequent campaigns. 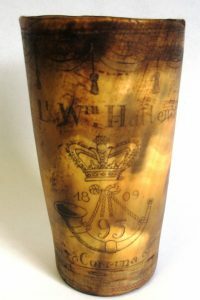 The presumed owner, and perhaps commissioner, of this horn drinking beaker – William Hallen – was promoted 1st Lieutenant in the 95th on 28th August 1804. He was promoted captain on 11th May 1809. Given that the rank abbreviated on the beaker is that of Lieutenant, it must be assumed that Hallen commissioned, or perhaps himself engraved, the beaker between the publication of the earliest engraved portrait of Moore in January 1809 (during which month the 1st/95th arrived home from Spain) and prior to the notification that he was to be promoted to command a company in early May 1809. At that time, the retreat to Corunna – spelled – ‘Corruna’ on the beaker – and the death of Moore would have been very much current news and were events of considerable significance for the officers of the 95th. 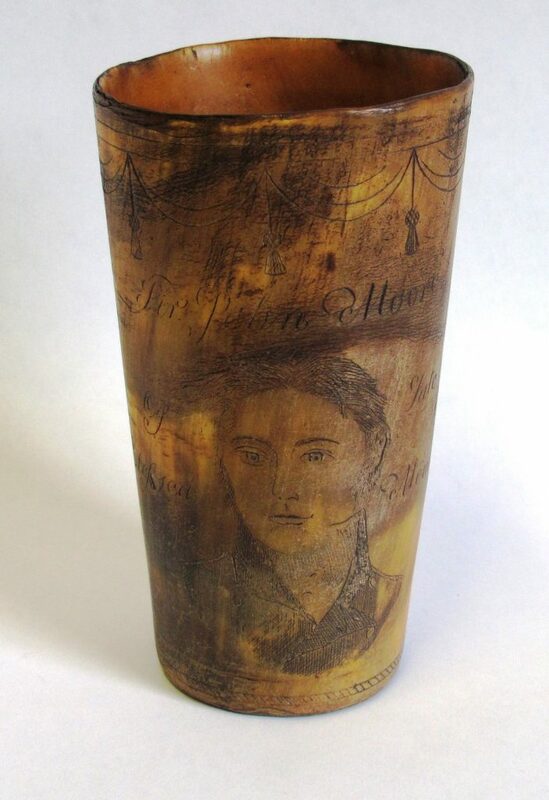 There is every reason to believe, therefore, that this beaker – which may well have been one of several made at the time – is a contemporary memento of the retreat to Corunna (Hallen’s first experience of active service), the 95th’s part in that retreat and of the death of Sir John Moore at Corunna.